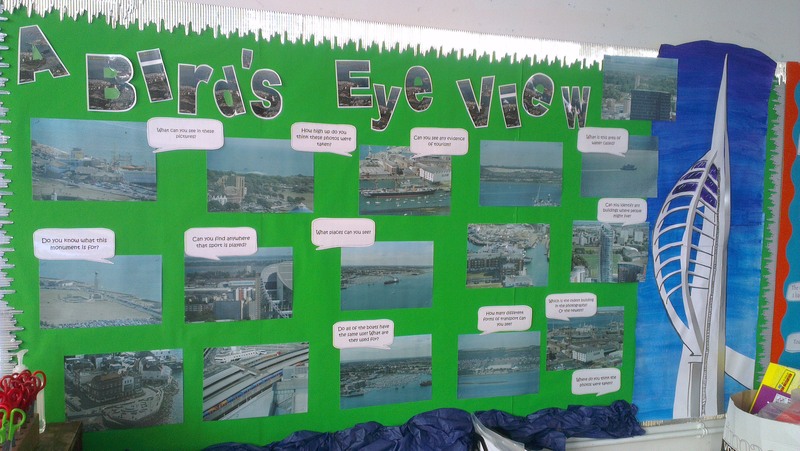 Our topic this half-term is A Bird’s Eye View and although these pictures aren’t the top-down view normally associated with a bird’s eye view, they are still taken from high up. From the Spinnaker Tower in Portsmouth in fact. 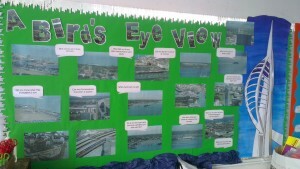 These are photos with questions asking the children to think about the land use. For example, which are the oldest or newest buildings in the pictures? Are all of the boats used for the same purpose? What evidence can they see of tourism? Every class at Riders sponsors a child from Tanzania. This is led by @clairemarie00, so please direct questions to her! But we will be writing letters to Nuru and hopefully receiving some too. 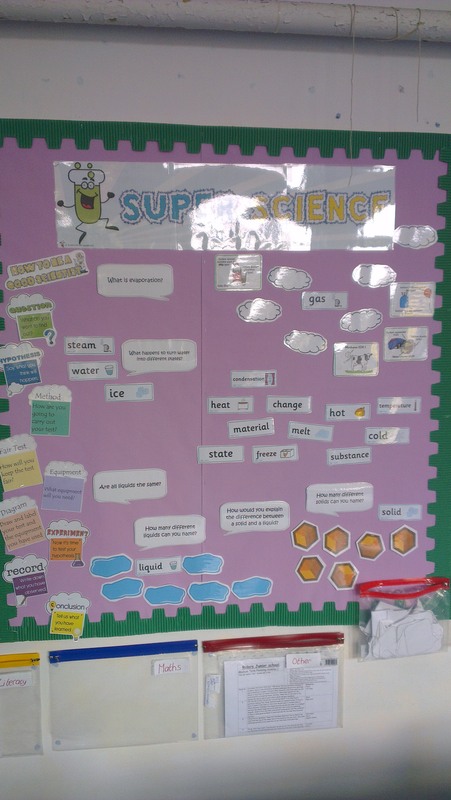 My Science topic is States of Matter and the wall has a variety of vocabulary related to solids, liquids and gases. 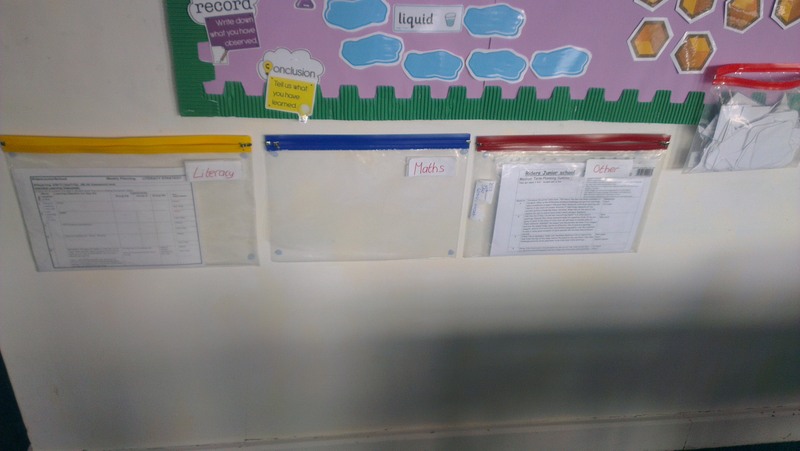 As the topic progresses and we carry out investigations, we will remove some of these and replace them with photos of the children working and carrying out investigations. 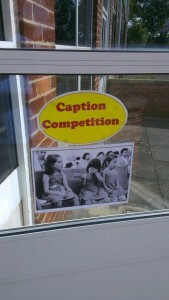 I want to get the children to ask their own questions and this will be happening in the first lesson. One thing in our school is that planning should be readily available to a visitor such as the Head Teacher and actually, it is also useful for the team of LSAs to be able to grab it if they need it. So I have zippy wallets on the wall with planning in them. 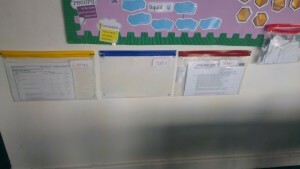 I have two areas to my maths wall and one is a whiteboard. This will allow me to draw methods quite easily to demonstrate to the children. 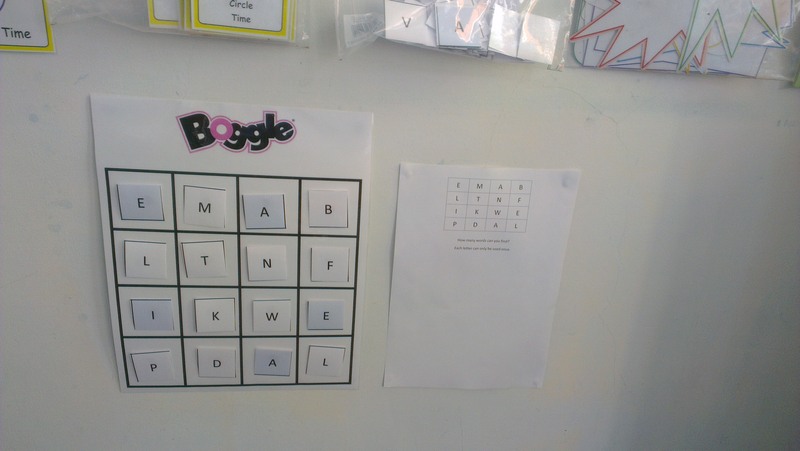 The bottom area of this board contains a range of maths challenges in plastic wallets. 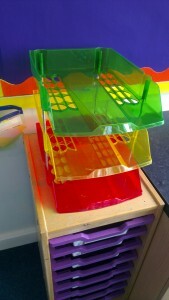 These are ideal for the children when they come in before school or during the register. They can grab a challenge and have a go. 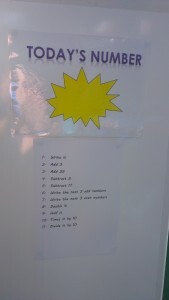 Some of these have been taken from, or adapted from, the 7Puzzle blog. 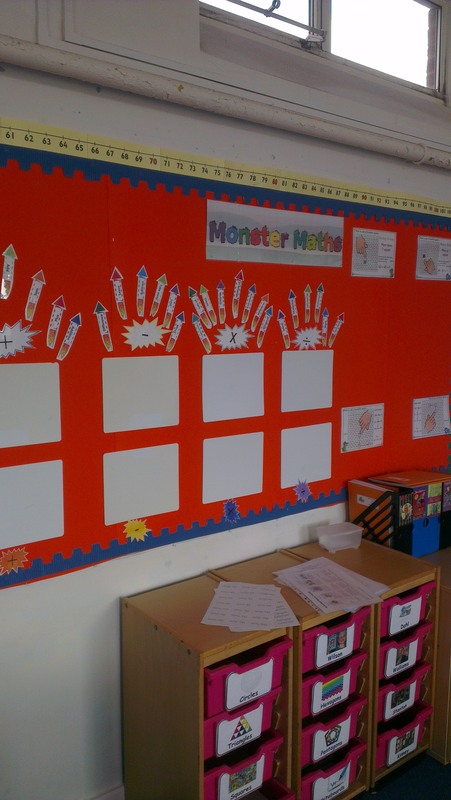 The other aspect of my Maths display is the “traditional” display with the 100 square (when it arrives), the number line, and the vocabulary for the four operations. I also have whiteboards blu-tacked to the wall to enable me to scribble ideas on if we need to. This is a Teacher Toolkit, taken from an idea from @MrsPTeach’s blog post. Jo has written a great guide of how to make one and although I can’t claim the credit as my wife made mine, I still think it’s a fab idea. I now have somewhere to put little things that I often lost in drawers such as staples, my whistle or hair bands for the child who forgets theirs when it’s PE! Another idea borrowed from Jo’s blog is these trays from Viking. 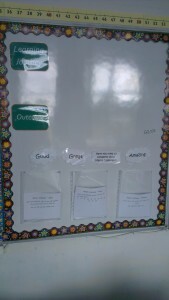 They are coloured to enable me to quickly see at the end of a lesson which children have achieved the objective. I won’t use them in every lesson, but it’s always useful to see where the children think they are and how they perceive their learning to be going. 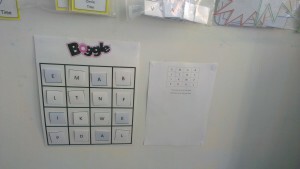 There are a couple of challenge areas around the room and another morning activity is Boggle. 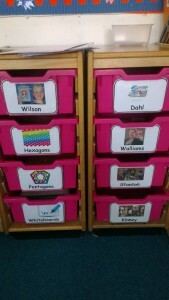 Each week I will pick a range of letters and the children can have a go at finding words that use those letters. 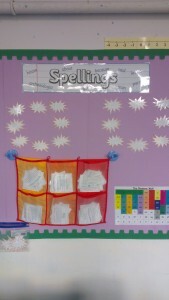 There is a sheet of paper to record their words. As we move through the year, I’d like to get them finding multiple words on their own sheet of paper or in their morning books, but we’ll start slow. 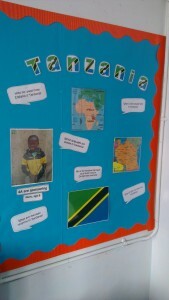 I will also find an image from Twitter every week to get the children thinking. 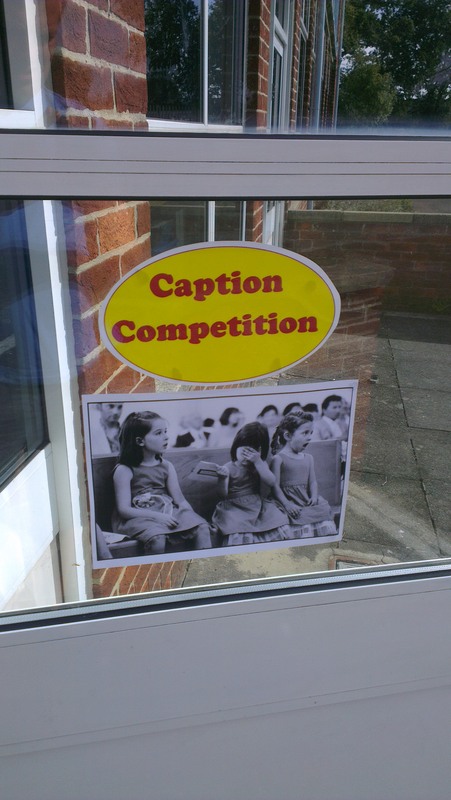 It might be to write a story about the picture, it might just be to write a caption, we will see how it goes. The third challenge is Today’s Number. Each day I will choose a number and they then have to follow the prompts below e.g. multiply it by ten, write the next three even numbers and so on. I have about 6 wallets like this around my room. 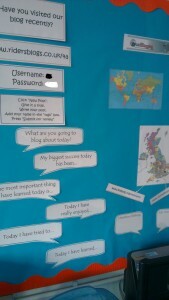 Some contain laminated stars, some have post-its and some have speech bubble notes (again from Ikea). 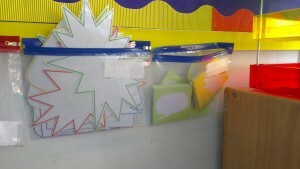 These will be used to add pupils’ ideas to displays. When they have a great word or a question, an answer or any suggestion, it can be added by them, quickly. The Literacy display isn’t quite finished yet, but the whiteboards will come in handy for the objectives. This is similar to the All/Most/Some or Must/Should/Could type displays but I think that Good/Great/Amazing is more positive. Each one will have mini-targets on for the children to aim for. For example if we were writing a story, I might say that a Good story will have an interesting opening sentence, a Great story will contain adverbs and an Amazing one will also contain complex sentences. I found that in my last class, the children wanted to make their writing as brilliant as possible and they loved suggesting difficult things to add to their writing. At St John’s, we focussed on questioning and it is something I think that I do very well. 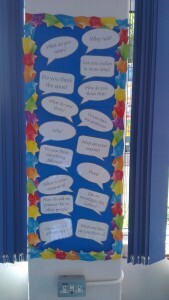 On my wall I have a range of questions to act as prompts when the children are working with each other. The idea being that one of them is the question master and they might start playing devil’s advocate and probing the decisions the group has been making. 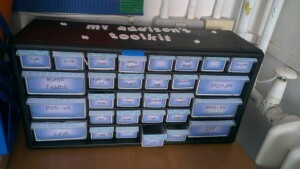 When we are working in a group, I like to use toolkits. 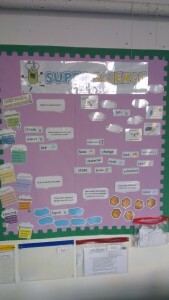 These are packs of resources to help the children achieve their objectives. 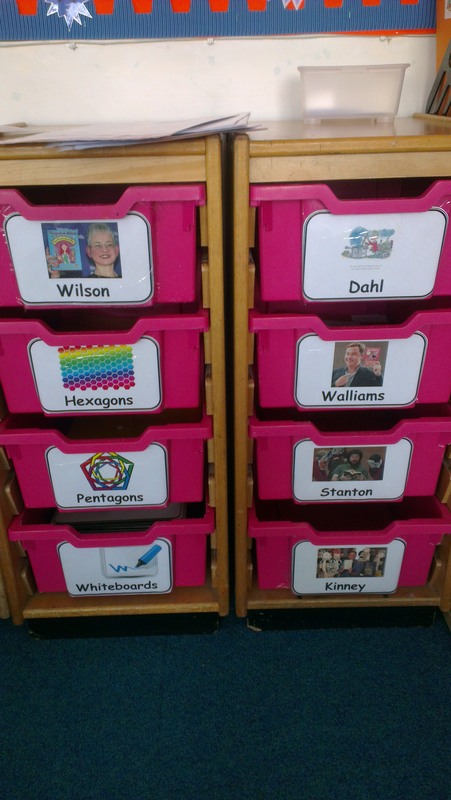 In the Maths drawer, there will be 0-9 dice and number cards to help children generate numbers when trying new methods or skills, 100 squares and multiplication squares to help reinforce counting and times tables and any other equipment that they might need. In the Literacy drawers there will be examples of different punctuation, connectives and sentence openers to hopefully improve their writing. These will be on the wall too, but having a physical card in their hand, might help a few children. This is my Reading corner. It’s quite a novelty as I have tended to have small classrooms before and I’ve never had a room big enough for a whole corner! Each month I will choose a different author to focus on. On the board we have a few questions about the author and his books e.g. How would you get your own back on George’s grandma? In the pockets on the wall I will have books by the chosen author. 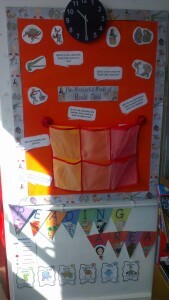 The last display is a blogging display. 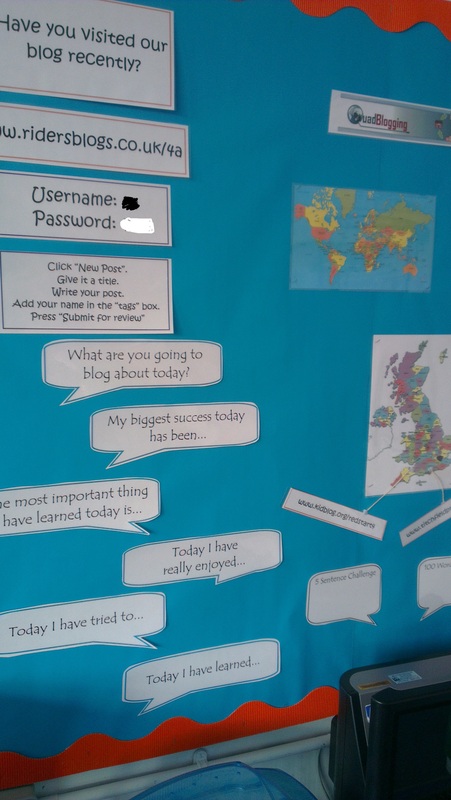 I have a class computer and the blog is a completely new idea to the school. 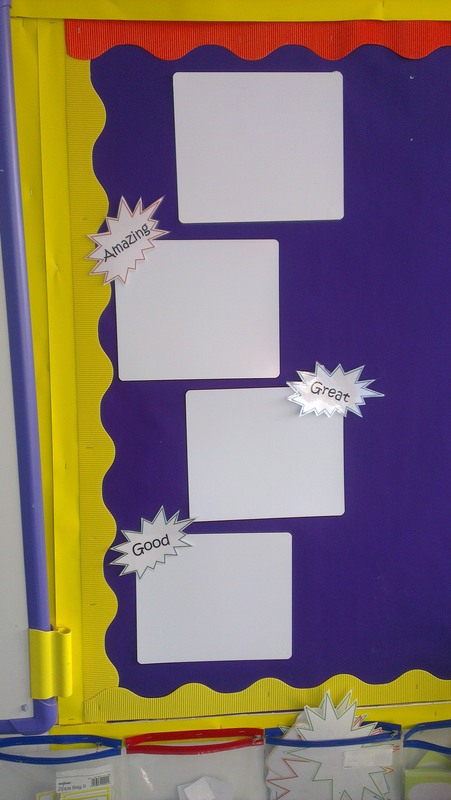 We will be launching it this week and I wanted a display to show where our quad classes were and to also give ideas for what to blog about. I have adapted Simon McCloughlin’s Twitter prompts as we won’t be tweeting for a while yet. There are a few things to note, the class is huge so there are lots of displays, and also, there isn’t anything from the children on display yet as we have only just started back. Very few of the displays are static and I believe that it is important to change them regularly and to consult the children too. However, with that many boards, I couldn’t wait until September to get them all put up! I wanted the children to have lots to look at, to inspire and to make them think and I will adapt and change the displays as the year progresses. 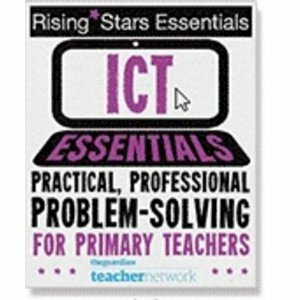 As I am no longer focusing on ICT, I will hopefully be blogging more about my general class and my teaching so will share how they change throughout the year. 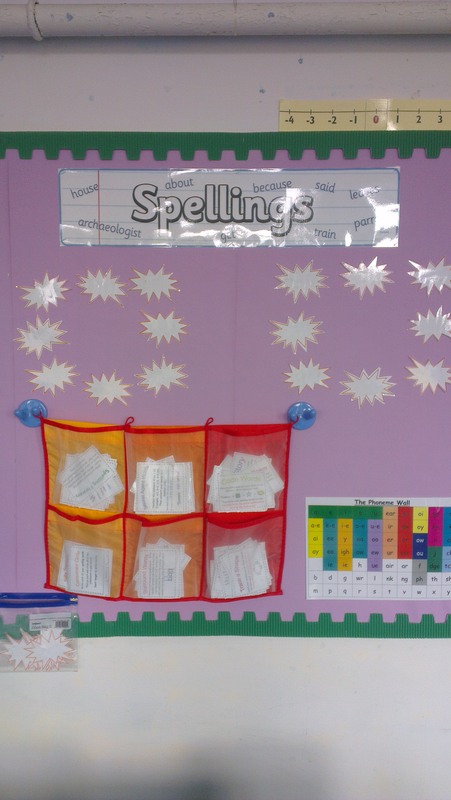 For a great series of blog posts looking at the use of classroom displays, visit Simon McLoughlin’s blog.